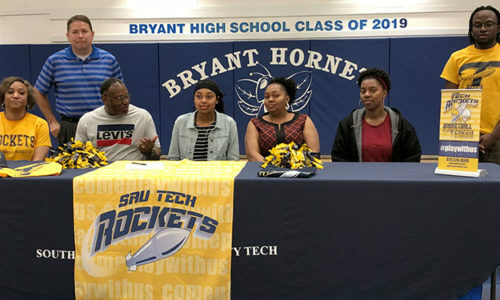 The sophomore-laden Bryant Lady Hornets basketball team opens play in the Class 7A State Tournament at North Little Rock tonight at 7 p.m., against the Van Buren Lady Pointers, the number 4 seed from the 7A-West Conference. The Lady Hornets finished fifth in the 7A-Central with an 11-15 overall record and a 6-8 league mark. Van Buren is 16-10 and 8-6. “When you look at how our season’s gone, I think the fact that we qualified for State is a good thing,” said Bryant head coach Brad Matthews. “It’s an accomplishment for this group as young as we are. We kept growing as the season went on. The two schools were conference rivals in 2015-16 and prior so there is some familiarity. Matthews remembers well, point guard Jamilyn Kinney, one of four seniors on the team. “Their point guard is really good,” he said of Kinney. “She’s as good as there is. With the exception of Christon Williams at CAC, I think she’s as talented an offensive player as there is in the state. She has unlimited range from the 3-point line, tremendous ball-handler, can beat people off the dribble then make plays. “They put two or three shooters around her and they are a very difficult match for just about everybody,” he added. “We’ll have our hands full guarding her. She’s very, very good. We were in their league her freshman and sophomore year and she was really good then and she’s done nothing but get better. “They’re not as tall, as big as some of the people we see in the Central,” the coach mentioned. “There’s not a six-foot shot-blocker. There’s not 5-10 guards that we have to navigate. But Van Buren does a great job in their half-court match-up zone. They do a really good job, rotating and bumping. They do a really good job trying to keep people off balance. We hadn’t really seen that since Bentonville in early December, so we’ve spent a lot of our practice time trying to prepare for that as well. The Lady Hornets have had several players lead the team in scoring in past games. Junior guard Kalia Walker came into the season with the most varsity experience. She and Robyn Gordon, a 6-1 post player that has improved considerably as the season has progress, are the only non-sophomores on the team. Point guard Tierra Trotter and India Atkins along with forwards Celena Martin and Ivory Russ are usually in the starting lineup. Russ missed the last few games due to concussion protocols and Martin missed the team’s last game with Conway due to illness. Sharp-shooting Lexi Taylor is one of the first girls off the bench. Bryant and Van Buren have a few opponents in common including Bentonville, whom the Lady Hornets lost to 62-30 on Dec. 1, at the Crabtree Invitational there. Van Buren has played the Lady Tigers three times, winning the first two times they met. In the pre-conference season, Van Buren also played 7A-Central teams, Conway, Mount St. Mary Academy and Fort Smith Northside. They lost to Conway and Northside and defeated Mount while the Lady Hornets lost to Conway and Northside twice each and defeated Mount St. Mary twice. The winner of tonight’s game will take on Conway in the second round Friday at 4 p.m.
Game 2 — Springdale Har-Ber (13-14) (West 5) vs. Little Rock Central (17-9) (Central 4), 1 p.m.
Game 4 — FS Southside (4-20) (Central 6) vs. Springdale (18-9) (West 3), 4 p.m.
Game 6 — Bryant (11-14) (Central 5) vs. Van Buren (17-10) (West 4), 7 p.m.
Game 8 — Rogers (12-14) (West 6) vs. FS Northside (24-3) (Central 3), 1 p.m.
Game 9 — Fayetteville (22-3) (West 1) vs. game 2 winner, 4 p.m.
Game 10 — North Little Rock (23-4) (Central 2) vs. game 4 winner, 7 p.m.
Game 11 — Conway (25-3) (Central 1) vs. game 6 winner, 4 p.m.
Game 12 — Bentonville (22-5) (West 2) vs. game 8 winner, 7 p.m.
Game 13 — Game 9 winner vs. game 10 winner, 12 p.m.
Game 14 — Game 11 winner vs. game 12 winner, 6 p.m.